I wrote the post below several years ago titled: The Comfortable Place, long before anyone really read my blog. When I wrote just for me and used this blog as a place to store my memories. Yesterday’s post was also written as a Thank You to all those that had something to do with my amazing Seattle trip and also a place to store my pictures that I took. Today when I came on to read everyone’s sweet comments, I noticed that wordpress had attached some of my older posts that related to yesterdays and HAD TO share this one. It really captures just how much last week’s Seattle trip means to me. I wrote it years ago, never dreaming Seattle would ever happen for me again…. Pictures of my cousin and me… (You can see the book case behind the chair) Also, the Lake that we visited…. Sometimes my mind replays like a home movie. Summer time and being a kid always snaps me right back to my grandma’s at Lake Washington. 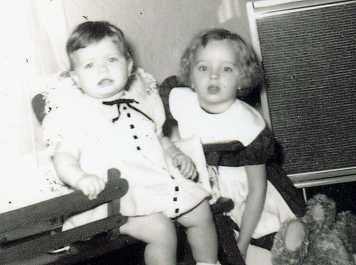 My cousin Pammy was my first best friend and we would spend a few weeks together each year there, and I always had “Summer” to look forward to. Back then, the simple things filled me up with such contentment and joy. If only I could bottle those moments and take a swig every time I needed to feel that feeling again. Funny how later, I let other things get in the way of those trips. I think that I was about sixteen and driving the first year I missed Seattle because of boys and jobs and other things I thought were more important back then. Now, I would give anything to recapture some of those moments for just a few days in my life. I remember the smell of coffee and the first rays of sunlight flooding my room as I would pad down the stairs on those lazy summer mornings. Our days were not filled with anything special. Most were just hanging out and swimming and exploring the nearby woods. Sometimes I would invent adventures that my cousin usually was a willing participant in. We could spend hours planning shows and making tickets for our parents who would be the audience whether they liked it or not, or walking to the nearby store and sometimes sneaking to the lake instead. Every empty building held a story that I would make up. The old girl’s boarding school, now all boarded up, (which to be honest, I really don’t know what that building really had been) held stories of characters that I would build adventures around. The big old corner house at the end of the block was definitely haunted. As well as the Synagogue around the block and our grandma’s basement! I was a writer and my imagination was my pen and my sweet little cousin a willing reader. Today, those memories are like old books on a shelf, stories tucked inside the pages, not forgotten but hazy from time and space. Once opened, the scent of the pages and the joy of remembering seem to snap you into another time and place. Much like today. It is summer. So many decades later, and I want it all back. I want to go down the rabbit hole and spend my day in yesterday where our biggest problem was what bathing suit to wear to the pool. This last weekend, I spent a few days visiting my childhood best friend. I met my daughter up there and we bunked together. I realize more and more how my baby reminds me so much of my little cousin and realize that I actually have “made” my own best friend! I enjoy her so much and love the quirky, crazy wonderful, fun, talented person she is becoming! It was so much fun having a slumber party with her for just a few days. Each night we would talk until the wee hours of the night… about silly memories and important things, about things that made us laugh till we cried and other things that just made us cry. It reminded me of that comfortable place I shared with my cousin so many years ago. And for a tiny moment, I was transported back to those lazy summer nights where nothing mattered and yet every minute was the most important of all and it made me treasure the fact that every moment is what you make it. Next Article To Put Me Together Again! Lovely post bringing back my own childhood memories. That means a lot when something I write takes someone on a journey all of their own! I believe I remember reading this when it first appeared. 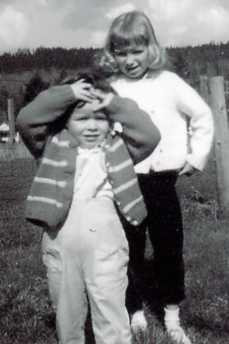 I loved the pictures of Cute Little Diane. Wow. Really???? Cool. I wrote it five years ago before anyone was barely following me. As I have said several times, I started my blog as kind of place to keep my own journal. I am not sure how people found me, but I love how it kind of magically happened. This place is my soft place to land now. And meeting such special people like you along the way has blessed me a thousand fold! “Let the memories flow, as the mind recaptures all the good to make you smile and adds the bad into the trash file”. ” a writers pen is like a Magicians wand, it makes the imagination run wild, creating and building to the hearts desire”. So I needed your words more than ever! Thank you.